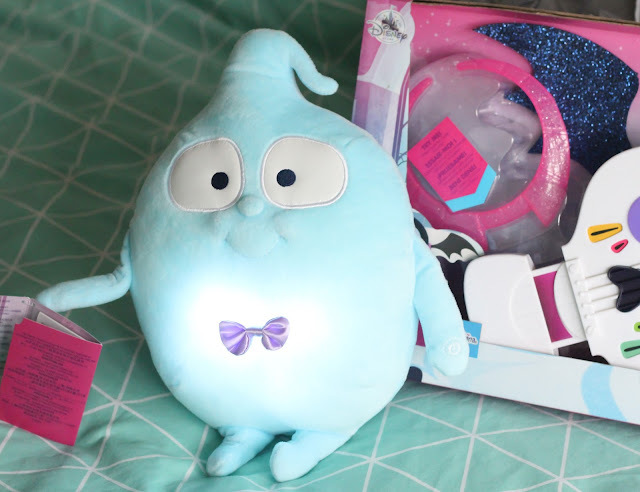 A couple of weeks ago, the kind folks at the Disney Store asked if the boys would like to try out some of the new Vampirina merchandise and knowing how much my boys love all things Disney - I had to say yes! Incase you're not familiar with it, Vampirina is a Disney Junior show based on the Vampirina Ballerina books and is one that all of the boys love - and I have to admit, I'm quite a fan myself! The theme show alone is pretty catchy and has been stuck in my head for the past week! 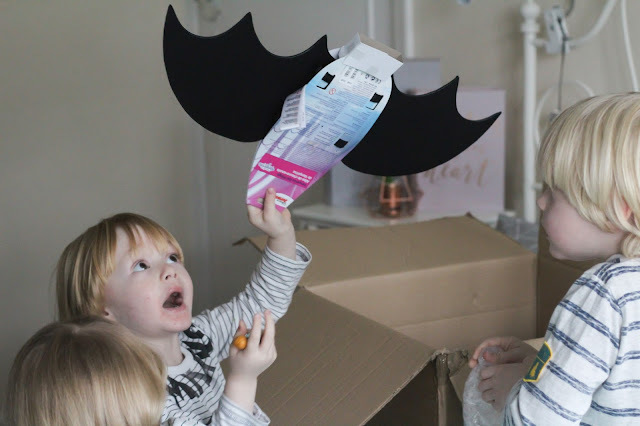 When the Disney Store parcel arrived, the boys excitedly tore into the box to see what was inside. 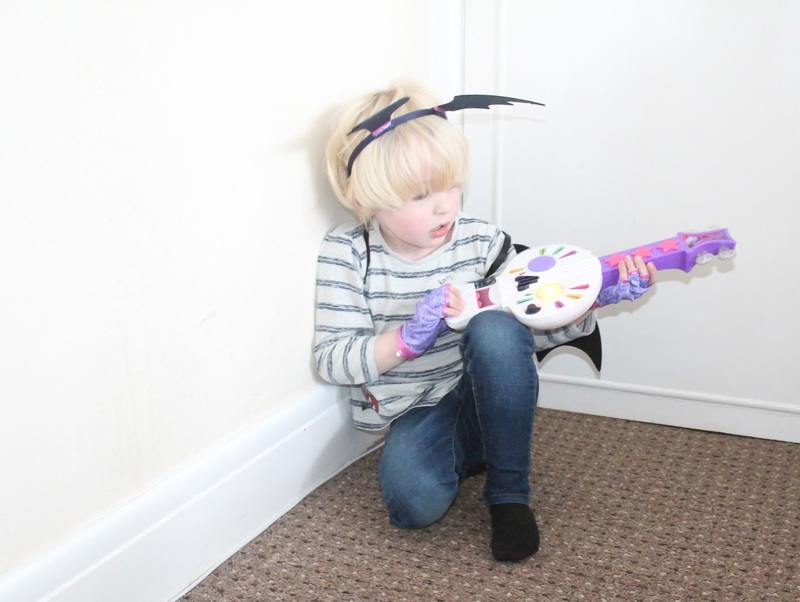 A super fun Spookylele set (RRP: £25.00) featuring bat wing deely boppers, a necklace, super cool fingerless gloves and the spooky skeleton ukulele which plays Vampirina songs as well as allowing little ones to hit some notes of their own. Vampirina Bat Wings (RRP £13.00) which transform your little one into Vampirina in an instant - they fit comfortably on the back using arm straps. 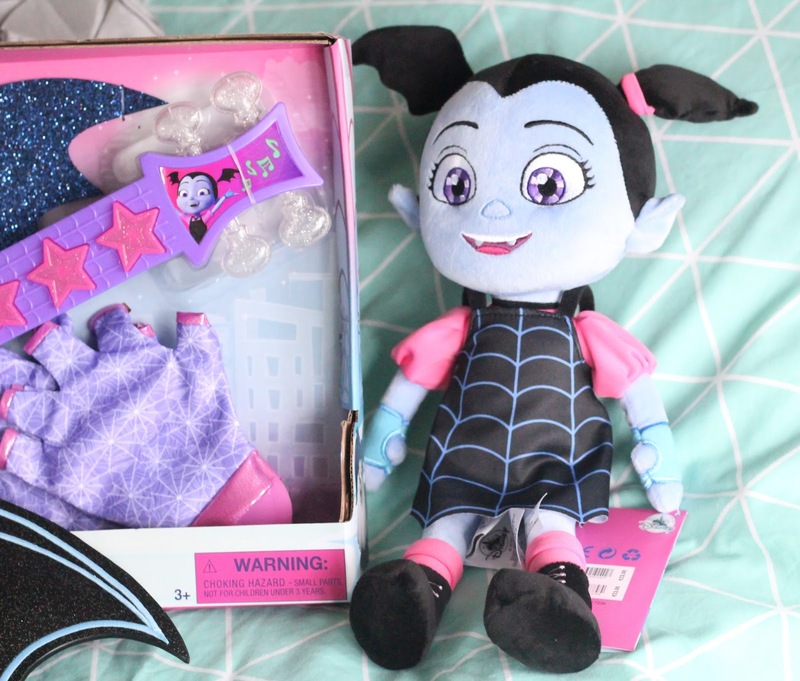 A super cute Demi Soft Toy (RRP £15.00) - one of Vampirina's ghoulie friends, this adorable little guy lights up when cuddled - it is super cute!! So what did the boys think of the toys? Well as I expected, they were a huge hit! I don't think we've ever owned anything from the Disney Store that has been disappointing as the quality is always top notch and the cute factor high and these products were no exception. 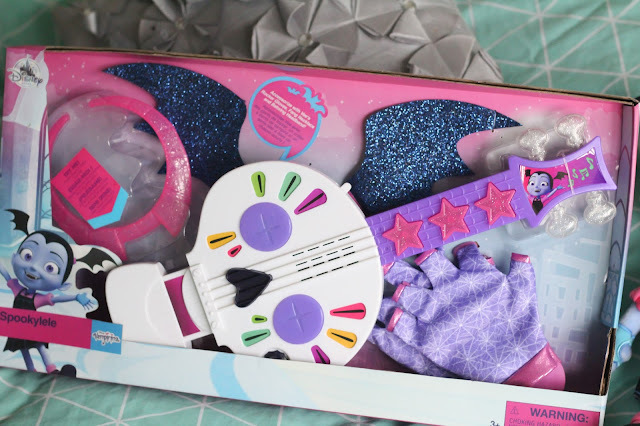 Sailor in particular (age 23 months) just ADORED the Demi plush - he grabbed it out of the box immediately and gave it a big cuddle, and when he saw it light up he squealed with delight and shouted "MINE!" refusing to put it back down again! Noah wasn't really in the mood for photographs unfortunately but he adored the Vampirina plush and she has been living in his Disney Frozen castle ever since she arrived - he plays with her most days, and takes her to bed to cuddle at night. And as for my 4 year old son who I actually thought would be the only one that probably wouldn't have much interest in the Vampirina range since he's at an awkward age where he really hates getting involved in anything he considers "Girly"...which will usually include anything with the colour pink or a female character on much to my dismay!...well, take a look for yourself! 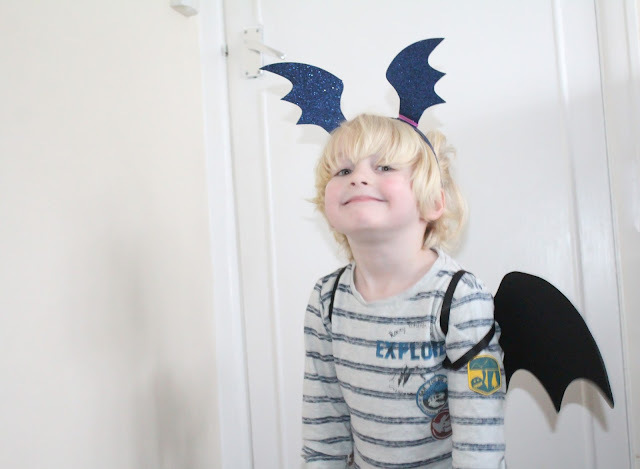 He had an absolute ball dressing himself in the bat wings, and the Spookylele dress up props! 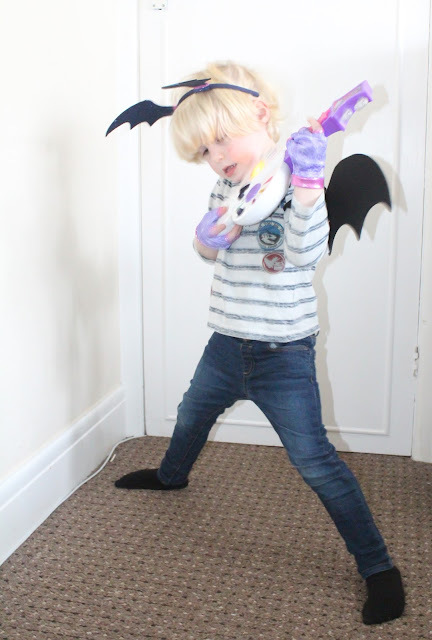 He declared himself to be a "Super Vampire Rockstar" and put on a show for us as he played Vampirina's ukulele and rocked out to her catchy tunes! 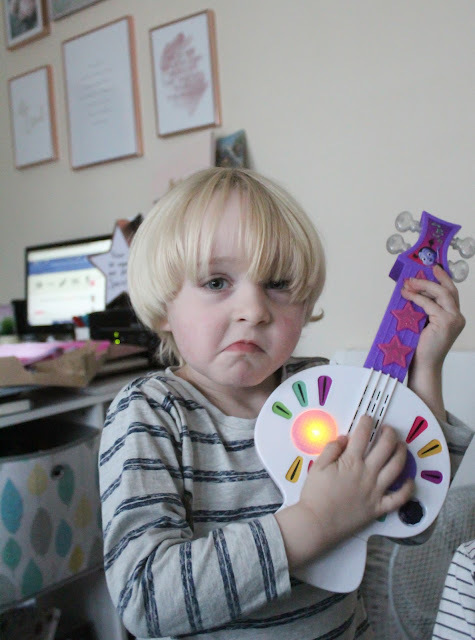 He commented on how similar the ukulele was to the guitar in Disney's Coco which we saw recently. 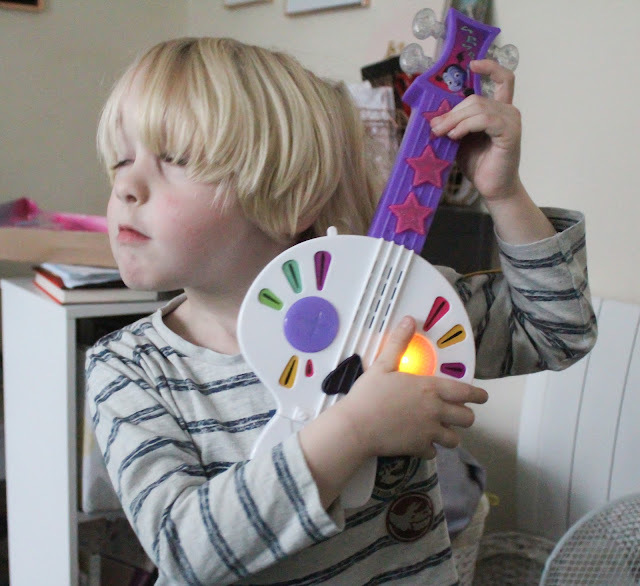 He adored Coco so he was thrilled about this, and what followed was a good half an hour of imaginative play where he pretended that he was Coco in Vampirina's world! I was pretty impressed at the imagination he was showing! 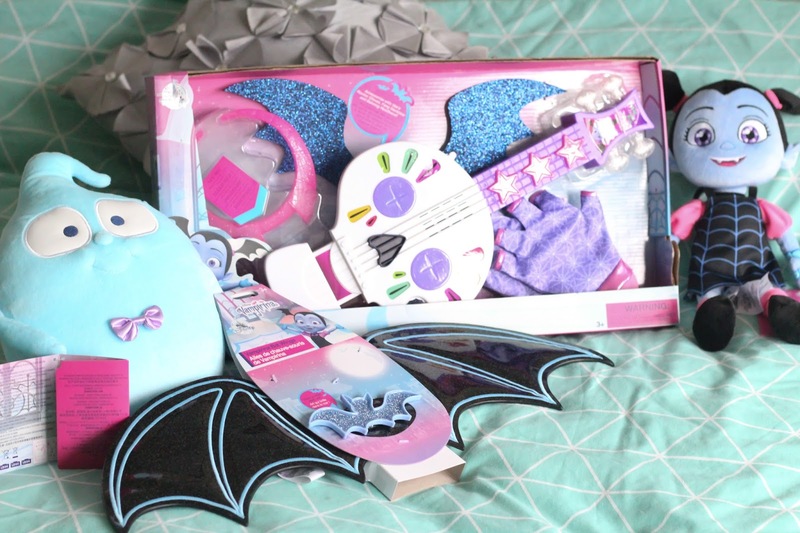 All in all, the boys have had so much fun with the new Vampirina products and everything has endured their somewhat heavy-handed approach to play well - if you have a Vampirina fan at home, I would highly recommend these great toys!